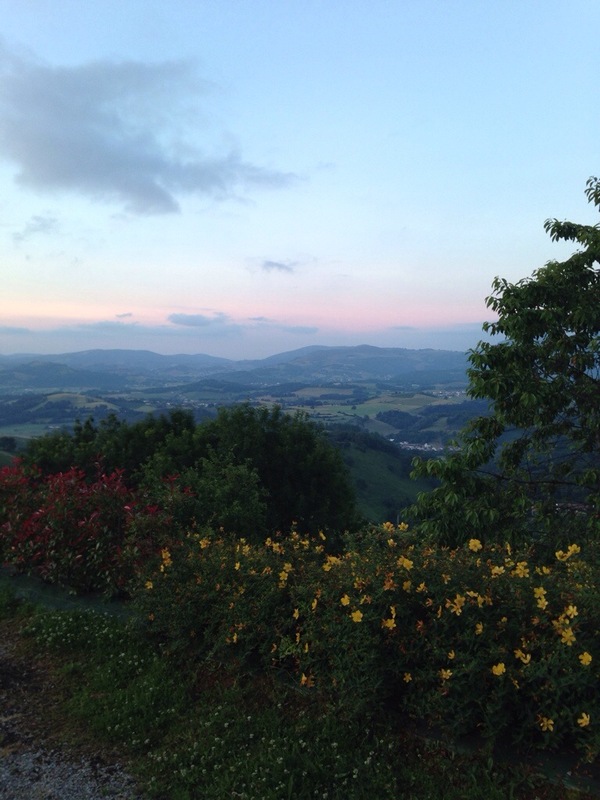 Today Jon & I walked 27.4 km from Roncesvalles to Losanna with heavy bags and new friends. Yesterday while our ‘class’ of pilgrims hiked for 7 hours up the Napoleon Road of the Pyrenees Jon and I drove down to Pamplona to buy some supplies, drink frapaccinos in a mall, and return our rental car. Worst pilgrims ever! 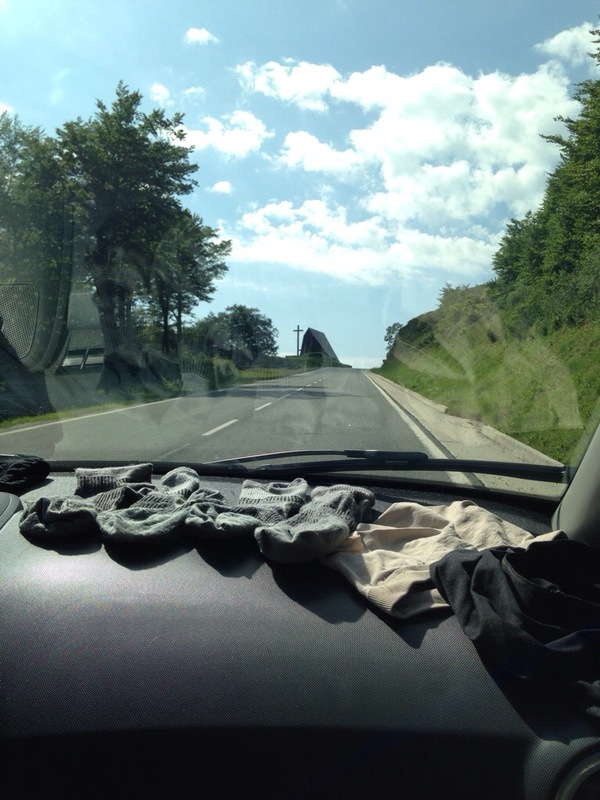 We had to drive past our fellow pilgrims huffing and puffing up the hill with our own underwear drying in the windshield of our CAR! It was necessary for us to drive, but we felt like such losers! We took a bus to Roncesvalles last night to sleep & start our camino today, but everyone in our hostel called us the “taxi pilgrims”. Oh well, we brought too much and had an embarrassing start. Isn’t that the best, to start off humbled and realize your not an all-star, but a fumbling pilgrim in need of growth. That’s exactly how we felt and still feel. We had an incredible night with a Benediction service with all the pilgrims last night in medieval church where Charlemagne use to worship. There was a choir that sang so beautifully for us that everyone was tearing up. The priest discussed how the camino should change your heart and help you grow in love for your fellow pilgrims and the Lord. He raised his hands over all the pilgrims and blessed us for our long journey to Santiago. An incredible moment. Today we walked most of the way with Alfred, a French pilgrim on his 3rd camino and Felix our new BF from Madrid. Alfred and Felix made us an incredible meal with cheese and wine at the hostel tonight and Jon and I are finally feeling like we belong. No longer the posers who showed up in a car from Barcelona, but pilgrims now; tired, sore, and content with little. Let’s see what day two has in store for us. The camino is our teacher if we are willing to learn and change. Posted in Camino de SantiagoTagged Camion de SantiagoBookmark the permalink. You may start out as “the worst pilgrims ever”, but I’m confident your redemption will come quickly as you enter into the shared experience of the the Camino with your fellow pilgrims and give generously of yourselves and God’s love along the way. May your journey be a blessed one…Godspeed, dear friends.